This is the perfect ice skating dress for gypsy or peasant music. The traditional scarf-wrapped skirt look has cute ties on one hip. 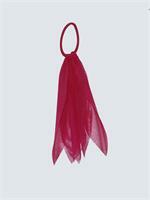 You can tie the 'scarf' skirt layer to show your personal style. Flutter sleeves in mesh add softness to the boldly striped bodice, and peacock-print spandex mock 'sash'. Full skirt flows when you skate. Bright color combinations will give your skating routine character! AB crystals are scattered on the bodice stripe, and mock 'sash'. 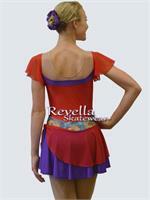 Ice skating dress shown in red and purple. Also available in ocean blue and purple. Want a different color? Simply choose 'custom colors' from the drop down menu, then select the color you want from our optional color choices below. 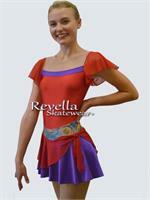 Optional colors are available on all of our ice skating dresses. Search terms: short sleeves, competition, flowy, ice skating dresses.